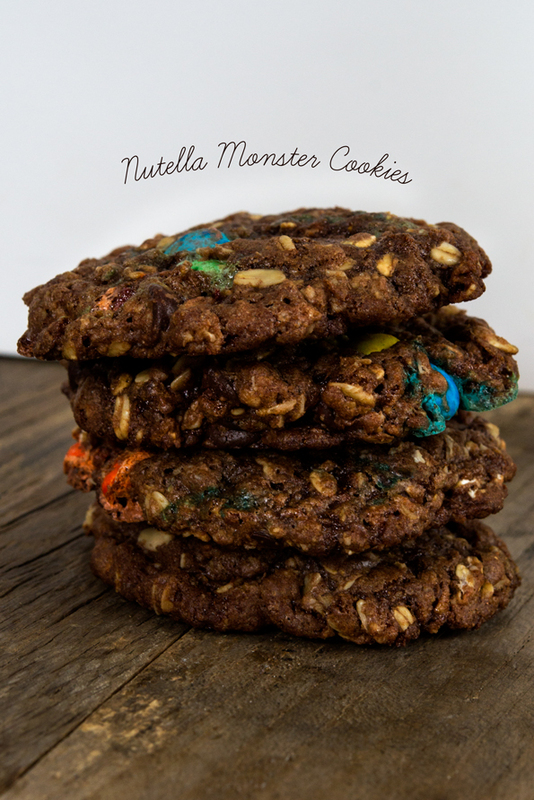 These gluten free Nutella monster cookies are like a cross between a nut butter cookie and an oatmeal cookie. Made with Nutella instead of the traditional peanut butter, they’re a truly special treat. 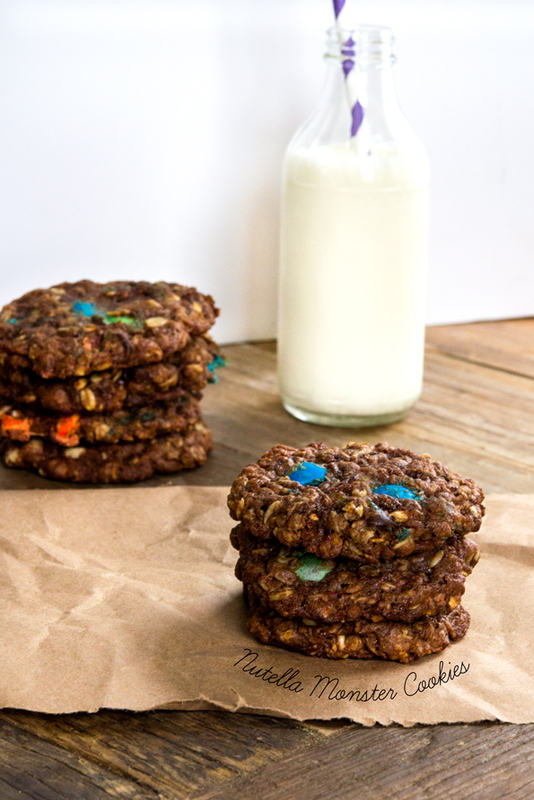 Classic monster cookies are naturally gluten free (yay! ), made with peanut butter and quick-cooking oats, and no flour. They’re big and chewy and packed chocolate chips and M&Ms. But if you’ve ever tried making them, you know that they don’t hold together all that well. Made with Nutella instead of peanut butter, these hazelnut-flavored monster cookies are made with a bit of gluten free flour to help bind them. It’s worth it. Nutella is a nut butter hazelnut spread, but it simply doesn’t behave in baking the same way that peanut butter does. It’s a much thinner, even stickier spread. Taking a traditional no-flour monster cookie recipe and replacing the peanut butter with Nutella will not work. I know this because I tried and I failed. A few words about the oats. Be sure you’re using certified gluten free oats, that are free of any cross-contamination from wheat. And I never buy quick-cooking gluten free oats. I simply take certified gluten free old fashioned rolled oats and process them by about half in a food processor. First, pulse the oats in a food processor or blender (in small batches) until they are reduced in size by about half. Then, in a large bowl, place the processed oats, flour, xanthan gum, baking soda, granulated sugar and brown sugar, and whisk to combine well, working out any lumps in the brown sugar. Transfer about 1 tablespoon of the dry ingredients to a medium-size bowl, and add the M&Ms and chocolate chips. Toss to coat, and then set the bowl aside. Create a well in the center of the large bowl of dry ingredients, and add the shortening, Nutella, eggs and vanilla, mixing well to combine after each addition. Add the M&Ms and chocolate chips and reserved dry ingredients, and mix to combine. The dough will be thick and chunky. Drop the dough by about 1 1/2 tablespoons onto the prepared baking sheet, about 2 inches apart (they will spread during baking). Between moistened palms, roll each piece of dough into a round and press into a disk, then replace on the baking sheet. Place the baking sheet in the freezer for about 10 minutes, or until the dough is chilled. Place in the center of the preheated oven and bake until set in the center (10 to 12 minutes). Remove from the oven and allow to cool on the baking sheet until firm (at least 10 minutes). I am so excited to make these today! Tips to all other Scandinavian bakers: I used Semper oat flakes and just crushed them a little by hand and as flour I used Semper Fin Mix. As “white”sugar I used DanSukker finkornigt strösukker. They turned out very good. So a big hand to Nicole for keeping us in cookies! Oh dear. Back to the same dilemma here. Wondering how coconut oil would act in these…probably too close to butter? Phooey. Might have to back it down and see how the texture feels. I could make these babies RIGHT NOW! Worse than butter. Way worse, Chris! Why not just use nonhydrogenated vegetable shortening, as the recipe directs? I don’t own it. The stuff kinda creeps me out. I guess I’ll have to read the ingredients list again and see if I can actually make myself buy it. Not that I would use it but…would good old-fashioned lard work?!? I don’t know what’s wrong with me and why I “hesitate” when a recipe calls for shortening…..showing my age, perhaps…..
Makes sense that Nutella misbehaves. It’s first two ingredients are sugar and oil, not nuts. It tastes mighty fine, though. Someday I’ll get around to making the dairy free versions I’ve seen online. 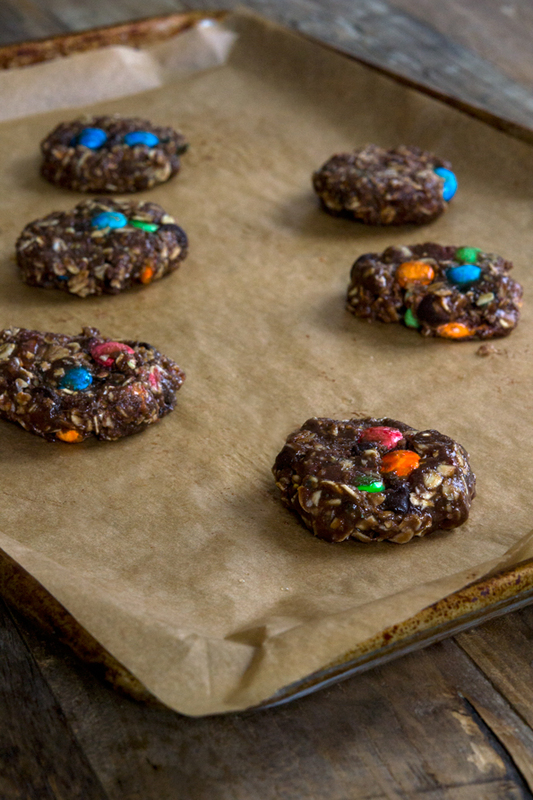 We don’t do oats in our house, but like always, these cookies look amazing!! I love monster cookies!! thanks for this variation – I’m sure they will be just as loved and I do not care a hoot that you had to modify – it’s still GF isn’t! win, win, and win!